Why oh why, did this third period kill us? 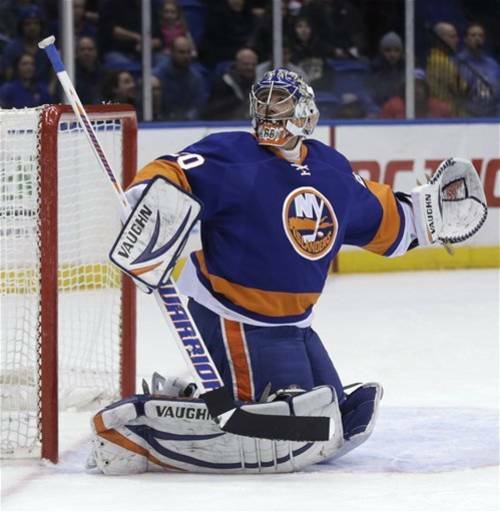 With a 5-1-1 record in March before this crucial four game home stand, there was talk that this may be the opportunity for the name Islanders to show some relevance again. For the second consecutive game, the opponent came back in the third frame. In this case, the Senators did not squander the deadlock away. A case of “HUH?” as Toronto overturn a goal by Keith Aucoin which would have Tuesday night’s version of Casey Cizikas. But to no avail, as Ottawa would take the lead with sixty seconds remaining and get an empty netter a few seconds later for the 5-3 victory. The Islanders have given up seven goals in the third period of the past two games. Not a good tale for a team that is trying to make a move to first half of the standings sheet. Keith Aucoin played a strong game too. Despite a mishap causing an Ottawa goal; his line was creating chances and getting in Ottawa’s face throughout. But, despite all of these good things, if you can not be smart and prevent opportunities from your opponent, you will not win ANYTHING. This game was the Isles for the taking, and they just let the Sens come in and swoop it away. Again, I am not an expert, in spite of the fact that I call myself a student of the game. I can only speculate and come up with a theory; which is the truthful statement that despite the effort, there is no killer instinct with this team. You have a team by the proverbial jugglar, and you don’t take the last slice. This team will NEVER see a promised land, unless they find a way to SEIZE THE DAY! Thursday and Friday will provide even bigger tests. Two of the top 3 teams in the conference come calling. Montreal has lost twice to the Isles, and believe me, they have been reminded of it by the Montreal media many times. There will be a spring in their step, and thousands of Bleu, Blanc and Rouge. Not easy. Get your head’s together Islanders, and get back to work. Get those heads clear and focused. You need these four points DESPERATELY!